Blockbuster is about to file for Chapter 11 bankruptcy and will close up to 800 stores. According to the WSJ, the move would wipe out Blockbuster’s debt and leave the company ready to take on the online market. My question is this: Who still goes to Blockbuster? Anecdotally, I know our 80+ year old neighbors do – they enjoy a film now and again – but the physical stores are a millstone around BB’s neck. While I don’t wish any company ill, I feel like they missed the boat in electronic video streaming and are now idling on the shore watching everyone else enjoy the cruise. Hell of a metaphor there, really. 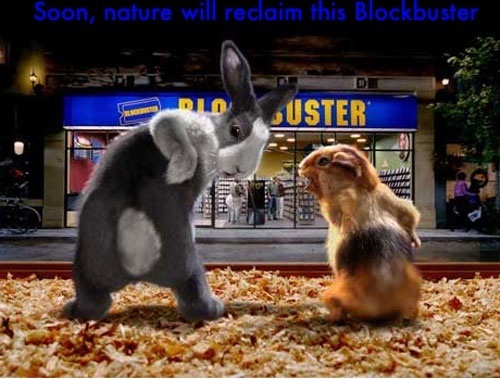 Place your bets: How many believe Blockbuster will be sold by 2011?